In a civil lawsuit filed in federal court in Manhattan, US Attorney Preet Bharara was seeking damages and losses on Deutsche Bank-issued mortgages backed by US taxpayers via HUD. The world’s third largest bank is majority-owned by the Warburg dynasty that funded Hitler. (2) It also needs to answer for its role in short trades made just prior to 911. Days after 911 Bush SEC Chairman Harvey Pitt, who was later forced to resign over his pathetic response to a series of corporate scandals, appeared on CNN to reveal a pattern of unusually heavy volumes of short selling of both airline and insurance stocks in the week prior to 911. Pitt vowed to track these trades down, speculating that al Qaeda may have been involved. It was the last time anyone in the Bush Administration mentioned it. According to the Herzliya International Institute for Counter Terrorism (Sept. 21, 2001)– an Israeli anti-terrorism organization – the ringleader in shorting these stocks was Deutsche Bank Alex Brown. An article in Baronscorroborates this fact. American and United Airlines and the reinsurance giants who covered the WTC – Munich RE, Swiss RE, and the French Axa – were specifically targeted. On September 10th – a day before the attacks – the put/call ratios on these stocks was unprecedented. A put is a futures option that bets on a stock’s decline, while a call is a futures option that bets that the stock will go up. Deutsche had ties to Enron’s LJM and Chewco partnerships. Enron also hired away SEC officials, while recruiting heavily from CIA to staff its global security operations. Some speculate that the vast pool of money that disappeared into the Enron abyss may have been a slush fund for 911 short-trade profiteering, or even for the operation itself. The Four Horsemen – now majority-owned by Deutsche Bank via the Banker’s Trust buyout (see The Four Horsemen Behind America’s Oil Wars) – got their desired US military presence in Central Asia courtesy of 911. With the US occupation of Afghanistan and new US bases popping up all across Central Asia, Big Oil’s Caspian Sea bonanza would now sport US taxpayer-funded armed guards. Former BP Amoco director Zbigniew Brzezinski’s 1997 book The Grand Chessboard… called Central Asia the key to global power and singled out Uzbekistan as the key nation in Central Asia. Once the US began bombing Afghanistan under the pretext of going after bin Laden, no country received more visits from US officials than did Uzbekistan, which was ruled by former Communists whose government had been “softened up” by years of CIA/al Qaeda destabilization. All that came to a sudden halt on 911. The US established a forward military base in Uzbekistan as well as bases in Pakistan, Kyrgistan and Tajikistan. In January 2002, after the government of former Unocal negotiator Hamid Kharzai had been installed in Kabul, Unocal executive Zalmay Khalilzad was appointed Bush envoy to Afghanistan. The first item on the Karzai/Khalilzad agenda was to revive the Unocal-led Centgas effort to build a Four Horsemen gas pipeline from Dauletabad, Turkmenistan across Afghanistan to the Indian Ocean Port of Karachi, where a US Naval Base was planned on the land earlier given to the Sultan of Oman. In 2005 Chevron bought Unocal. On August 28th, just two weeks before 911, Deutsche Bank executive Kevin Ingram pled guilty to laundering heroin proceeds and arranging US weapons sales to parties in Pakistan and Afghanistan. A June 15, 2001 New York Post article said Osama bin Laden was the likely buyer. The $400 billion a year global drug trade – long a major economic engine of Eight Families’ wealth – surged after 911. The Taliban cracked down on opium production in 1999, a move that helped seal their fate. A November 21, 2001 article in The Independent was titled “Opium Farmers Rejoice at the Defeat of the Taliban”. On November 25th The Independent ran another piece titled “Victorious Warlords Set to Open the Opium Floodgates”. The article describes how US-allied Afghan warlords – following their rout of the Taliban – set about encouraging Afghan peasants to plant “as much opium as possible”. Asia Times Online reported that the US sprang convicted drug lord Ayub Afridi from jail to help organize a CIA cadre of $200,000/year hired Afghan thugs, who were ordering opium production revved up. Their plan seems to have worked. On January 4, 2002 the Christian Science Monitor reported an explosion in south Florida heroin and cocaine traffic not seen since the contra/mujahadeen heyday of the 1980’s. Was it a coincidence that Columbian military forces and their oligarchy chiefs who run that country’s drug trade launched a major offensive against FARC in February 2002? Were they too now using the cover of war to move cocaine into south Florida? By 2005 Afghan opium production was off the charts. Osama bin Laden received financial support from now-deceased Saudi billionaire Sheik Khalid bin Mahfouz. Bin Mahfouz was represented in the US by Washington, DC law firm Akin, Gump, Strauss, Hauer & Feld – the same firm that represented the Muslim Brotherhood House of Saud and their world’s largest Islamic charity – the Holy Land Foundation for Development & Relief. Akin Gump had defended bin Mahfouz – a Chevron Texaco Central Asia partner – when the BCCI scandal broke. Three Akin, Gump partners are close friends of President George W. Bush. A 1999 Saudi government audit found that bin Mahfouz’ National Commercial Bank had transferred over $3 million to Osama bin Laden charities that year. Bin Mahfouz could not be accused of disloyalty to family, since he was now Osama’s brother-in-law. Both Salem and Mohammed bin Laden died in mysterious plane crashes. As the two jumbo jets crashed into the World Trade Center on 911, another of Osama’s brothers – Shafiq bin Laden – was attending the annual investor conference of Carlyle Group in Washington DC. 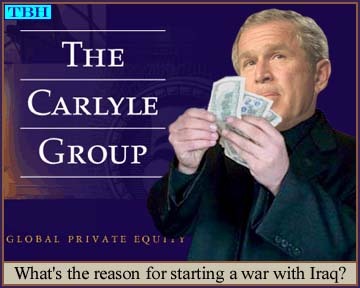 The bin Laden’s had $2 million invested in Carlyle Group. (13) They also held big stakes in Microsoft and Boeing; and had extensive business dealings with Citigroup, GE, Merrill Lynch, Goldman Sachs and Fremont Group – recently spun-off by Bechtel. One of the speakers at that DC conference may have been George Bush Sr., who now worked as financial adviser for the Mellon family-controlled Carlyle Group – chaired by Frank Carlucci, who was Reagan and Bush Defense Secretary and chaired Reagan’s National Security Council. Carlucci worked with mobsters in the 1961 CIA assassination of Congolese Prime Minister Patrice Lumumba. (14) He was a Yale roommate of Bush Jr. Defense Secretary Donald Rumsfeld. They were joined at Yale by James Baker and George Bush Sr., who was a member of Skull & Bones – alternately known as the Brotherhood of Death and The Order – a name shared by ancient Afghan Roshaniya terrorists. Carlyle Group was founded by Carter aid David Rubenstein in 1987. It is a private equity fund that specializes in recycling petrodollars from Persian Gulf sheiks back into Eight Families’ banks and corporations. Through Carlyle bin Laden Group made big investments in Citigroup, the Dutch banking giant ABN Amro, Nortel, Motorola and GE. In November 2001 Carlyle quietly severed its ties with the bin Ladens. Soon after he became Governor of Texas the company went belly-up. Carlyle swooped in to buy up its remains at a bargain price. Bush oversaw a $10 million University of Texas investment in Carlyle while he was governor. Carlyle owns a big chunk of Ford’s aerospace division and Harasco, a manufacturer of military vehicles. Carlyle is the 11th largest defense contractor in the US. It is 20%-owned by Mellon Bank (http://www.dkosopedia.com/wiki/Mellon_family) and is controlled by the powerful Blackstone Group (seeOverthrow of the American Republic), which dined cheaply on the carcasses of looted S&L’s at auctions held by Bush Sr.’s Resolution Trust Corporation. Blackstone, whose chairman Peter Fischer served as Council on Foreign Relations Chairman, also owned Bioport – the sole US manufacturer of anthrax vaccine. (21) In October 2001 Florida-based tabloids, major media outlets and Congressional members began receiving packets of lethal anthrax, later identified as the “Ames” strain. The Pakistan News Service reported on December 1, 2001 that numerous Bioport documents had been found in al Qaeda safe houses in Kabul. Admiral William Crowe – board member at Chevron Texaco and former member of the Joint Chiefs of Staff – acquired a 22% stake in Bioport for the very special price of $0. Crowe’s part of the bargain was to promote Bioport’s anthrax vaccine to the US military. Many Bioport stockholders were part of the Porton Down British oligarchy. Bayer – the German drug giant that emerged from the Nazi IG Farben combine financed by Deutsche Bank – saw sales of its antibiotic Cipromyacin skyrocket by 1000% as a result of the anthrax scare, as US citizens rushed to buy a 60-day supply of the anthrax deterrent for $700 a pop. Bayer had been teetering on the brink of bankruptcy prior to 911. According to Michael Davidson of From the Wilderness Publications, no less than twelve world-class microbiologists died under mysterious circumstances following 911. Dr. Don Wiley of the Howard Hughes Medical Institute at Harvard was found drowned in the Mississippi River days after his abandoned car was found on the I-40 bridge in Memphis. Davidson says several leading Russian and Israeli microbiologists were on Air Sibir Flight 1812, which was shot down by a Ukrainian missile gone over 100 miles astray on October 4, 2001. Several other prominent microbiologists were on a Swiss Air flight that crashed as it attempted to land in Zurich on November 24, 2001. Aside from the billions to be made by Bioport, Bayer and the Rockefeller-controlled pharmaceutical industry from the anthrax-induced public panic; Davidson saw in this mysterious slew of scientist deaths a darker plot to unleash a massive new global depopulation program. Shortly after 911 President Bush began tossing about the word “crusade” in a thinly-veiled attempt to conjure up images of the ancient Crusades, where Christian secret societies led by the Knights Templar worked with Muslim Brotherhood Assassins to attack nationalist Muslim Saracens. On September 26th – two weeks after 911 – Carlyle Group’s United Defense Industries (UDI) signed a $665 million contract with the Pentagon to complete its Crusader Advanced Field Artillery System. UDI stock skyrocketed. On December 14th Carlyle sold its shares netting a cool $237 million in one day. A day earlier Congress had approved the Bush defense budget, which funded the UDI contract with the US Army. In May 2002 – with Carlyle’s Blackstone owners cashed out – Carlucci’s Yale roommate Secretary of Defense Donald Rumsfeld announced the cancellation of the Crusader program. Carlyle owned BDM Federal of McLean, VA – just down the road from Langley. BDM’s Saudi offices are unmarked. Its role in the Kingdom includes training Saudi personnel in the operation of US-made weapons systems and modernization of the Saudi National Guard. BDM was awarded a $50 million contract to oversee the Saudi Air Force from 1995-1997. It got a $44.4 million contract to construct housing at the Khamis Mushayt military base. Some of the six Americans killed in the 1996 car bomb at a US military base in Saudi Arabia were BDM employees. In 2000 BDM got a $65 million contract to maintain the Saudi Air Force F-15 fleet. From its symbolic pyramid-shaped headquarters in San Francisco, TRW is one of three US credit reporting agencies that constantly collect information on all Americans. One of its more sophisticated NSA satellites is named Pyramider. In July 2002 Northrup Grumman bought TRW for $7.8 billion in stock – becoming the second largest US defense contractor after Lockheed Martin. Northrup boasts annual revenues of $26 billion and has 123,000 employees. TRW is the parent of Vinnell Corporation – now in its 26th year of “modernizing” the Saudi National Guard in cooperation with the US Army. The Saudi Guard is split into two units. One protects the kingdom from external threats. The other guards Four Horsemen-controlled ARAMCO oil installations from the Saudi people. In 1998 Vinnell’s bagged an $831 million contract from the House of Saud. A prior three year $163 million contract included Crown Prince Abdullah’s brother-in-law as junior partner. Before coming to Saudi Arabia, Vinnell made hundreds of millions of dollars constructing US bases during the Vietnam War, then made still more money blowing up those bases when US forces to pull out. A Pentagon official once described Vinnell to the Village Voice as “our own little mercenary army”. Three other spook outfits operating in Saudi Arabia are O’Gara Protective Services, Booz Allen Hamilton and Science Applications International Group (SAIC). O’Gara provides security for the House of Saud and other Gulf Cooperation Council monarchs. The House of Saud security detail also includes many American mercenaries. Booz Allen – based in McLean, VA – received a 5-year $21.8 million contract to upgrade the Saudi Navy in 1995. Booz also advises Saudi Marines and runs the Saudi Armed Forces Staff College. From 1990-1995 the Saudis spent $62 billion on US weapons. In late 2010 the Pentagon announced a $60 billion arms deal with the Saudis – one of the largest ever. According to the Center for Public Integrity, Booz Allen began receiving contracts for the Defense Advanced Research Projects Agency’s (DARPA) Total Information Awareness program before 911. Booz received 13 DARPA contracts worth $23 million. That was bested only by the 23 DARPA contracts worth $27 million granted to Lockheed Martin. Former CIA Director and Dyncorp CEO, James Woolsey, now works for Booz Allen. In 2008 Carlyle Group bought a majority stake in Booz Allen for $2.54 billion. SAIC received two House of Saud contracts in the late 1990’s worth $166 million, bringing the Royal Saudi Naval Forces communications and command systems up to speed. SAIC often brings Saudi personnel to its San Diego headquarters for training. The CIA contracted with SAIC to reassess Gulf War illness among US troops who served in the 1991 conflict. In 1995 SAIC took over Network Solutions – the company that assigns domain names and “oversees” the Internet. Rule by Secrecy: The Hidden History that Connects the Trilateral Commission, the Freemasons and the Great Pyramids. Jim Marrs. HarperCollins Publishers. New York. 2000. “Privatizing War: How Affairs of the State are Outsourced to Corporations Beyond Public Control”. Ken Silverstein. The Nation. 7-28/8-4, 1997.